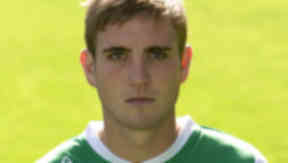 Young defender Darren McCormack had never sat a driving test when he was stopped by police while over the limit. Young Hibs defender Darren McCormack has been banned from driving after admitting hitting the road in his girlfriend's car while drunk. The 21-year-old, who has never even sat a driving test, had been out drinking on February 7 before heading to his girlfriend's flat. He said he became "worried and anxious" when he found she was not home. He then got into her Mini and drove off around the Leith area of Edinburgh to look for her. At Edinburgh Sheriff Court on Wednesday, he admitted driving without insurance or a licence, with 172 milligrammes of alcohol in his blood. The legal limit is 80. Defence solicitor, George More, told the court: "He had been drinking more than perhaps he should have been but drove off looking for her. "He is extremely remorseful for it. "He is a professional footballer for Hibernian and has been disciplined within the club." He added: "Because of his attitude to this offence and the club's attitude, he does not now take a drink at all". The court heard the footballer, from Lochend Park View, had taken 20 driving lessons but would now be unable to sit his test as a result of his admission of drunk driving. It also emerged McCormack had a previous conviction for road traffic offences, after being caught on a scooter without L-plates when he was just 16. Mr More told Sheriff Margaret Scott: "He sometimes plays for the first team and his take-home pay is £570 per week." Sheriff Scott banned him from driving, and thus sitting his test, for 12 months and fined him £500. He will be allowed to pay the fine at a rate of £10 per week.